MAMA’S HAWAIIAN BBQ OPENS NEW TUCSON LOCATION! Tucson, Arizona – June 5, 2017 – Mama’s Hawaiian BBQ has just opened a new location at 4016 N. 1st Ave. in Tucson. “We are thankful for the great support from the local community as we continue to grow,” said Mama’s founder, Sam Alboy. 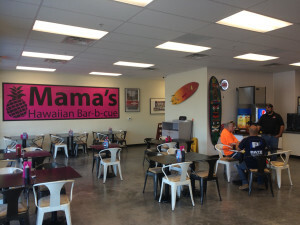 Mama’s Hawaiian BBQ was started in Tucson, AZ in 2010. The company has locations in Tucson, Sahuarita, and Anthem, Arizona. Mama’s features traditional Hawaiian Plate lunches and dinners, homemade desserts, and daily specials. And, Mama’s offers delivery service to the areas it serves. In addition to dine in and take-out, Mama’s Hawaiian BBQ offers affordable catering. No matter the size of the event, Mama’s will take care of everything . Mama’s Hawaiian BBQ is a proud member of the Tucson Originals. Tucson Original restaurants all share one common bond, they exemplify the independent spirit and the rich culinary heritage that is Tucson. Formed in 1999, the Tucson Originals have been the driving force and model for similar groups all across America who are working to preserve the culinary spirit of their communities. With the rapid rise of chain eateries, this alliance has helped many of Tucson’s signature restaurants survive and thrive.